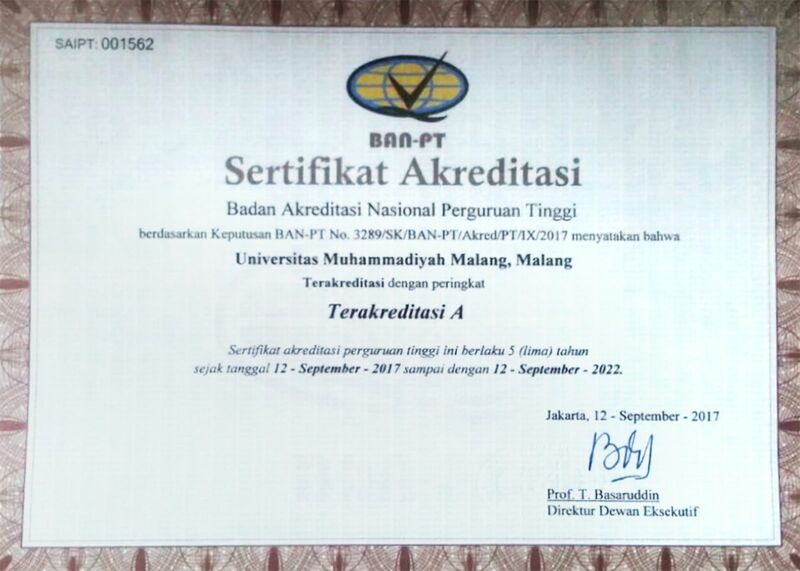 Institutionally, University of Muhammadiyah Malang got accreditation A from National Accreditation Board of Higher Education (BAN-PT) Ministry of Education and culture RI in 2013. Before that, in 2008, UMM got accreditation B. besides BAN-PT, UMM also got Two Stars from QS star (England), accredited KNAPP (Accredition National Commission of Research and Development Institution, accredited Good (BS EN ISO 9001) from NQA Global Assurance for Financial Bureau, Academic Administration Bureau and Bureau Student Affairs; Audited the Financial from MTD Registered Public Accountants (MTD No. AU-050/MTD/MLG/VI/2012) etc.